Trailhead and parking area are on Hurricane Mountain Road in Bartlett, NH (summit is in Chatham). Hurricane Mountain Road begins on the east side of Rt. 16/302, 0.1 miles south of Rt. 16A. There is a small pull-off on the left side of the road 1.5 miles in. Standing just outside of North Conway near the Maine-New Hampshire border, Kearsarge North, once known as Pequawket, dominates the small group of mountains around it. The inactive summit fire tower offers a unique perspective of the eastern White Mountains and western Maine which is among the best of the region. The trail starts at a small marsh on Hurricane Mountain Road. It crosses the marsh on an elevated gravel path and enters the forest immediately after. The trail parallels a small stream in the beginning, but soon starts to gain elevation quickly and lead up out of the ravine through which this brook flows. The trail proceeds uphill at a moderate grade through the forest with very few flat places for rest. The trail leads almost directly up the mountainside the entire way. After just over a mile and a half, the trail meanders by a small swamp, then emerges on open rock, where you will see the first views. The path climbs over the rock slabs for half a mile before re-entering the forest. After another half-mile climb over. Walking around the summit yields an extraordinary three-directional view. 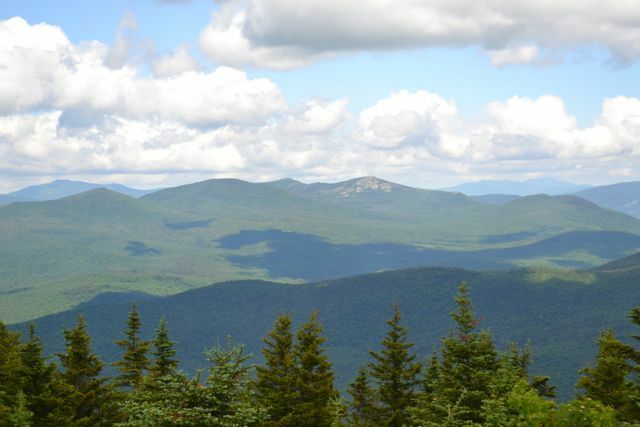 To the east is the huge expanse of flat terrain in Maine, with ridge-like Pleasant Mountain the only major hill. To the south, the view overlooks the valley around Conway, walled in by the Green Hills on the east and the three Moat Mountains on the west. The Ossipee Range is seen beyond Conway. Below the Moats are Whitehorse and Cathedral Ledges. Looming over the Moats is the long Sandwich Range, with the rocky Mt. Chocorua most noticeable over South Moat. Mt. Paugus rises over Red Ridge, and Mts. Whiteface and Passaconaway rise over North Moat. To the right of North Moat is Big Attitash Mountain, with the Tripyramids and Sleepers in the distance behind. To the west, you can see up the valley of the Saco River toward the central Whites. Mt. Tremont is next over from Attitash. The Osceolas and other mountains around Waterville Valley are seen off in the distance behind. Mt. Carrigain and the Nancy Range are due west, and the Twin Range is to the right. Climbing the fire tower reveals the northern view. To the northwest, the Montalban Ridge (in front) and the Southern Presidentials (behind) lead up to Mt. Washington; some of the Northern Presidentials can be seen to the right. Nearby are the two rounded humps of Doublehead Mountain. Above is deep, round Carter Notch; Wildcat Mountain forms the west wall, while Carter Dome rises to the east. To the north is the Baldface Range; on the left side are Sable and Chandler Mountains (Mt. Moriah is in the distance behind), and on the the right side are the Baldface Mountains and Eastman. Through the pass between rocky South Baldface and lower, wooded Eastman is the Maine side of the Mahoosuc Range. To the northeast are the Royces and Maine's Caribou-Speckled Range.